Mimaki announced today that it will launch the JV300-130/160 in June 2014. The JV300-130/160 is compatible with solvent and water-based sublimation inks, and provides a wide range of applications including outdoor signage, posters, interior decorating, vehicle wrapping. 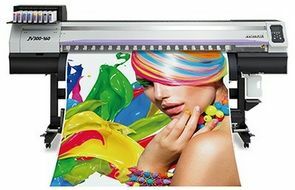 The JV300-130 and JV300 160160 output high-quality printing achieved by reliable and patented inkjet technologies and ensures high-speed printing at 105.9 m2/h* by combining two newly developed staggered printheads and high-performance, quick-drying SS21 ink. Two ink colors, orange and light black, have also been added. The orange ink achieves higher color replication with a wider color gamut, and the light black presents beautiful graduation printing. The SS21 ink continues to create value-added printing with its high scratch resistance and ability to reproduce vibrant colour within the print market place. Furthermore, using water-based Sb53 sublimation ink, the JV300-130/160 can be used for sublimation transfer printing. Click here to see the Mimaki JV300 video and specification.